The Four Seasons Island Resort Wisconsin Golf Package - The Four Seasons Resort Packages - Reopening! Golf Package on Miscauno Island! Four Seasons provides luxury accommodations in a modern, updated, all-suite resort which was added to the historic main building only a few years past. For your convenience, the lodging is connected to the main historic resort restaurants, bars, and banquet rooms. All lodging rooms are either full suites or 1 or 2 bedroom luxury suites providing your guests with ample space to kick back and relax after an enjoyable day. We also offer Dog Friendly Rooms as well. Developed in 1924 by W.D. 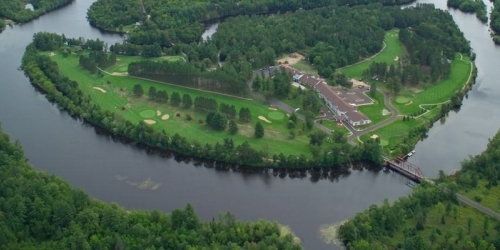 Mann, the 2809 yard par 34 course runs along the Menominee River on Miscauno Island. A challenge for all levels awaits you at The Four Seasons Resort Island Course. Our course features mature woods, large bunkers and luscious greens. Our signature hole is #6, 476 yard par 5 running adjacent to the Menominee River on the north side of Miscauno Island. Its green is bordered by our two surrounding rivers, the Menominee and the Miscauno Rivers. When calling 715-324-5800, please mention you saw this golf package on GolfWisconsin.com. The Four Seasons Island Resort reserves the right to change price and offer at anytime. Prices and offer are subject to change without notice. GolfWisconsin.com is not responsible for errors posted in this golf package.